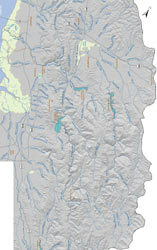 The Upper Alameda Creek Watershed is managed by the San Francisco PUC as part of the Hetch Hetchy water system. 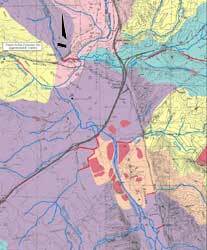 It extends from Sunol south to surround Mt. Hamilton. Most of the land is owned by the PUC or ranchers. There is very little development or access other than Sunol Regional Park. Calaveras Creek, Calaveras Reservoir, Indian Creek, Indian Joe Creek, Isabel Creek, Leyden Creek, Pirate Creek, San Antonio Creek, San Antonio Reservoir, Sheridan Creek, Smith Creek, Sulphur Creek, Valpe Creek, Welch Creek.